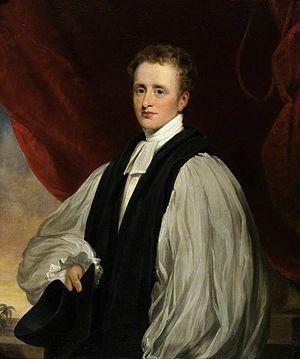 Reginald Heber was from 1823 to 1826, when he died prematurely at age 42, the Anglican Church’s Bishop of Calcutta. He was also a more or less superb lyricist. Although he wrote the “Holy, Holy, Holy” still used on certain days in the Anglican rite, most of his poetic output has been–I don’t want to say lost to the ages, because nothing has been lost. What has happened is that much of Heber, once a staple of boys’ textbooks all over the British Empire, has simply been censored. But what’s a touch of provincialism next to a glistening verse style, I always say. Consider the rollicking “Timour’s Councils,” which Heber wrote in 1816 about the Emir Timour, a Turk-Mongol king who tried to restore under the name of Islam the empire of Genghis Khan. Timour failed after running, in Heber’s telling, into something called winter. The spirit of the wintry blast! To bear those banners through the world? Can time nor space thy toils defy? O king, thy fellow-demon I! We reap the harvest of the grave. Then, tyrant, turn, and cope with me! How deadlier are my blasts than thine. Nor thine own pride shall warm thee then! Heber had style in great volume. Unfortunately for a writer living in the romantic age, he also had a happy life. As a child he was “distinguished by sweetness of disposition, obedience and that trust in God’s providence which formed through life so prominent a feature in his character…He could read the Bible with fluency at five years old, and the avidity with which he studied it, and his wonderful remembrance of its contents, astonished his parents. Indeed, from the moment he could read, his passion for books became insatiable.” What a bore! Where’s the despair? One cannot write next to Coleridge and compose next to Beethoven without at least an opium addiction. That’s where Heber went wrong. One of my favorites of Reginald Heber, “From Greenland’s icy mountains.” It’s a powerfully sculpted ode to the great physical beauty of the world, from Greenland to Africa, combined with the urge to–uhrm–civilize it all. Their land from error’s chain! Bows down to wood and stone! In bliss returns to reign. Heber’s other poetical acts of subversion can be read in this book, available in full online.